We're all about turmeric this November. Check out our list of fun facts for some surprising uses for this ancient spice. Turmeric serves as a natural pain reliever. 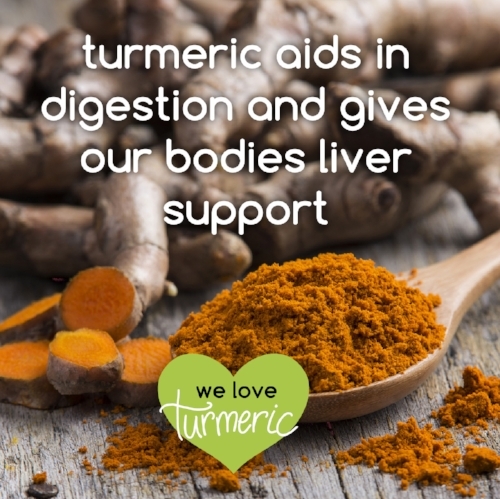 It also aids in digestion and gives our bodies liver support. It is a good source of Vitamin C, Magnesium, Iron and Potassium. Turmeric an be used for moderate skincare, especially for pimples, but be careful and keep in mind that it is widely used as a dye. Turmeric is often used as a fabric dye for clothing. Turmeric can be used for cupcake frosting and mustard coloring. The most common yellow dye, Yellow #5, is a petroleum byproduct, so use turmeric for a brilliant yellow coloring instead. Turmeric is a natural antivenom for bites from a King Cobra. If you have a leak in your water-cooled radiator, you can add a spoonful of the powder and the leakage will stop. You can make a paste out of turmeric to get rid of unwanted hair. Curcumin found inside Turmeric is also the only food that’s been shown to “melt away” ominous beta-amyloid plaques associated with cognitive diseases. The use of turmeric dates back nearly 4000 years to the Vedic culture in India, where it was used as a culinary spice and had some religious significance. India is currently the world’s largest producer and consumer of the powder. Ready for a dose of turmeric? Come by your Juice Bar and order a Toomeric Monster Shot!